There are signs all around us that we are changing for the better. It may not be drastic but every day small deeds add up and suddenly, one day, the change is evident. That is what Shahbagh represents for all of us: a chance to change. So make yourselves heard and spread the love this Valentine's Day and ask that person you like out already, cause we might as well go down fighting. -- Ahmad Ibrahim, Sub-editor, The Rising Stars. 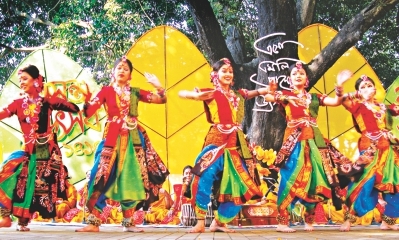 There was a time when Pohela Falgun was just that. People would dress in yellow and sing along to merry tunes to welcome spring. Today, it just acts as a precursor to something bigger. 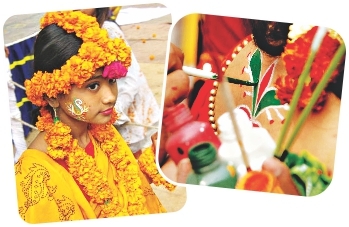 With all the buzz about Valentine's Day, Pohela Falgun is no longer what it used to be even thirty years back. To our grandparents and even parents, Valentine's Day was something unheard of. The thirteenth would be spent in silent rejoicing; that winter was finally over. People would dress in yellow and go out with friends, but not like we see today. And boutique houses certainly wouldn't have a Pohela Falgun collection. Nor would there be greeting cards and gifts for Falgun. Special deals at eateries, the loudspeakers blaring music, sometimes even concerts-how much of that did your parents see while growing up? And just how many of them heard about Cupid back then? What used to be quiet musings on the winter left behind has now turned into a celebration of youth, love, and maybe spring. Us, the younger generation, pick and choose our own culture. While we won't wake up for the Shaheed Minar on the 21st, we'll be planning our Pohela Falgun look at least a week in advance. What does this say about us? That we want to enjoy the good things in life but are ready to forget the sacrifices our forefathers made for us? Disturbing thoughts, indeed. We, the youth, are changing our culture. Ignoring some parts of it, while making a bigger deal of other things than they originally were. We catch on to the colourful celebrations, the fun and revelry, and make it ours. But we choose to forget the pain that we had to go through to enjoy these things. Ignorance? Or just plain downright selfishness? Some call it evolution, the natural order of things. Others call it corruption. But there's no denying that in the end, it's us that has to decide where we want to go with this newfound identity of ours. Till then, springtime, Falgun, whatever you call it, will come and go. The birds will chirp, the music will blare. It's just a matter of deciding what we want to listen to. Being single is like puffing on a cigar. You might enjoy it, but it's tough to convince others around you that you really mean it. February 15th is the day for all you loners, quirkyalones, forever alones, forever availables or whatever you'd like to call yourselves, because it doesn't matter what you like to call yourselves, you're all single. Accept that, because believe it or not, it's actually okay to be single. 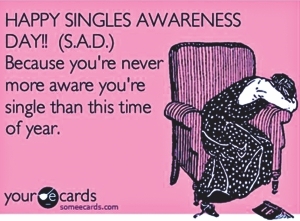 So no need to feel bad about it, come forth and enjoy yourselves on Singles Awareness Day! It's the day of the year where single people celebrate their single status and show their parents and friends who are constantly looking for people to set them up with that they're okay with being single. And for those who aren't happy being single, there are lots for them to do as well. But I prefer to stay indoors and cry in a corner. The best part about this day is that it comes right after the day where those couples occupy all the open spaces on sidewalks which aren't already taken by hawkers and tea stalls, go out on romantic rickshaw rides and sit near black, sewage-infested lakes and enjoy each other's company over a romantic meal of jhalmuri for two. They spent a whole day doing things that made you feel sad, lonely or mostly, disgusted. Now's your chance to show them how much fun it is being single. Except it's not and I'm slitting my wrist as we speak. There are lots of parties for singles in various places and you can even organize your own and invite all your single friends. You can exchange gifts with all your single friends and give them cards. With all the money you saved from not going on dates and not having to buy useless Valentine's Day presents, you can give yourself a treat or buy yourself something you've always wanted. You can dress however badly you want and do whatever you want without having to worry about what your significant other will think or be bound by any commitment. That's so depressing I'm halfway through my 3rd tub of ice-cream. For those who don't want to stay single and don't like it, go along to those parties and events for singles or volunteer for activities. It's a fun way to meet people and maybe you'll come out of your “forever alone” status… Or you'll get friendzoned. Though according to the writer's opinion that trying to get into a relationship would be a bad idea, you can go ahead and risk it if you want. So have fun and enjoy the day, because after a probably depressing day, you get to go out and celebrate a day meant entirely for YOU. So, here's to being single! The writer is clearly depressed and deluded and so we end this with a bit of advice to the writer: Don't buy a cat. That's a one-way street to loneliness, my friend. Basma Rahim Thank so much for that piece on women violence. BTW couldn't you have given some advice for women on how to protect themselves in a situation like that? Samiha Binte Seraj: “Shundori pakhi bou aar dushtu jamai”! Hahaha! Loved it! Tahmid Zaman: Am I the only excited to see Bradley cooper featuring in Pokemon Black and White 2? Magnificent Faiyaz: Guys don't let the mistake put you off, we NEED the BW2 review next week!! The Rising Stars: Flip to center.